Increasing energy demand is boosting the construction of new power plants which has a marked impact on the global gas turbine market. Growth in the orders of gas turbines is expected to have a high impact on the gas turbine inlet cooling systems market, especially in areas with hot climate. Decrease in inlet air density during the hotter climates reduces the plant efficiency, which in turn, results in power shortages and monetary losses to plant owners. Turbine inlet cooling systems increase the power output by cooling the inlet air. Cooling of inlet air increases the air mass and hence the output of the plant. The mutual occurrence of high temperature and peak demand (due to air conditioning and refrigeration) boosts the requirement of turbine inlet cooling systems. Technological innovations and modifications done by the turbine inlet cooling system providers have made these systems more efficient and compatible with the turbine design. A large number of turbine manufacturers have given their approval to turbine inlet cooling technologies. The report analyzes the three inlet cooling techniques: inlet fogging, mechanical chillers, and wet compression. Inlet fogging systems increase the air density by spraying fog droplets over the inlet air. It is one of the most widely used evaporative cooling technologies. Low operational and maintenance costs and approval from all major turbine manufacturers have augmented the demand for inlet fogging systems. Wet compression is a relatively newer technology and can be used in combination with other inlet fogging technologies. Mechanical chiller is one of the most efficient as well as expensive turbine inlet cooling technologies. Mechanical chillers can attain a temperature drop in inlet air of about 45°F, which is higher than most of the available technologies. Utilization of turbine inlet cooling technologies is assumed to improve the plant efficiency by as much as 10%. Installation of turbine inlet cooling systems has proven to be more economical than installation of additional turbines. As a result, a large number of power plant owners/operators are opting for turbine inlet cooling systems. Currently, North America and Rest of the World (RoW) have emerged as the two large markets for turbine inlet cooling technologies. A majority of inlet cooling system providers are based in North America, as a result of which, procurement of turbine inlet cooling systems and associated services (installation and repair) becomes easier for end-users located in the region. A majority of installations in North America are near the coastal areas of Texas, California, and other states. Moreover, the shale gas boom in North America which has led to the increased demand for gas turbines has further boosted the demand for turbine inlet cooling systems. As the production of natural gas is increasing, a large number of power utilities and independent power producers are shifting towards gas-fired power plants. The Rest of the World segment includes countries from the Middle East, Africa, and Latin America. These countries witness a significant drop in plant efficiencies during hot climates. The simultaneous occurrence of peak demand and decline in plant efficiency increases power shortage in the region. As a result, turbine inlet cooling technologies are widely adopted by plant owners/operators. The market in Asia Pacific is also expected to experience a significant growth during the forecast period. Increasing power demand and the common occurrence of power shortages and blackouts are expected to drive the demand for turbine inlet cooling systems in the region in the near future. Key participants in the global turbine inlet cooling systems market include American Moistening Company Inc., Caldwell Energy Company Inc., Cat Pumps Inc., Humifrio S.L., Mee Industries Inc., Score Energy Limited, Siemens AG, UTC Technologies Company, Camfil AB, and Baltec IES Pty. Ltd. This report provides an overview of these companies, followed by their financial revenues, business strategies, and recent developments. Rising demand for energy is driving the construction of new power plants globally. Despite the prevailing economic slowdown, demand for power is expected to grow on account of urbanization and rise in population. The drop in plant efficiency during summer seasons raises concerns related to blackouts and power outages. The solution to such problems is capacity additions. However, capacity addition either through the construction of new power plants or addition of extra turbines is both capital-intensive and time-consuming. Restricted by both time and economic constraints, power companies and turbine manufacturers are now opting to install turbine inlet cooling systems. Turbine inlet cooling systems provide cost-effective power augmentation. Mechanical chillers and evaporative technologies, such as inlet fogging and wet compression systems, are widely adopted by power producers and turbine manufacturers to boost turbine capacities, especially during the summer seasons. The research study is designed to analyze and estimate the market for turbine inlet cooling systems globally both in terms of volume (Units) and revenue (USD Million). 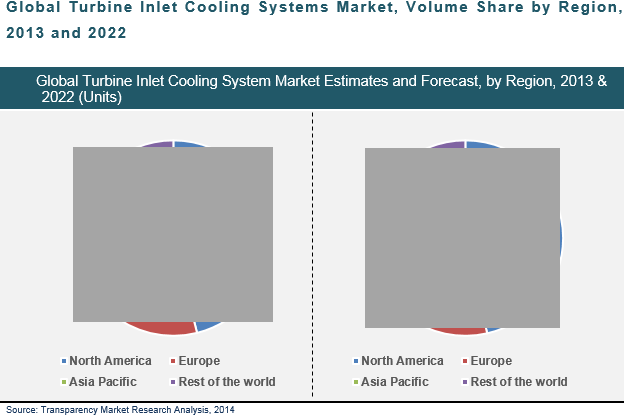 The global market for turbine inlet cooling systems has been broadly segmented on the basis of technology and geography. The market report only addresses three specific inlet cooling technologies: inlet fogging, mechanical chillers, and wet compression. These technologies are used to boost plant efficiency, especially in regions with hot climates. Utilization of inlet fogging technology reduces the inlet air temperature through spraying of small water droplets. Wet compression units are generally used in conjunction with other inlet cooling technologies to provide additional cooling to boost plant efficiency. Mechanical chillers can attain greater temperature reduction in inlet air than most of the other available technologies. In this research study, the turbine inlet cooling market has been segmented at a granular level, geographically. The global market has been segmented geographically into North America, Europe, Asia Pacific, and Rest of the World (RoW). Each of these regional segments has been further sub-divided into its constituent country-wise segments. A total of 12 sub-segments have been drawn from the four regions, which comprise eight unique country-specific analyses. The countries included under the scope of the report are China, Japan, and Australia in Asia Pacific; the U.S. in North America; Italy and Turkey in Europe; and Iran and GCC countries in RoW. The report features a detailed regional segmentation with market growth forecast for the 2014-2022 period. Similar detailed projections have also been provided for the technology segment. For this market study, 2013 has been taken as the base year, while all forecasts are for the 2014-2022 period. This report includes key market dynamics affecting the demand for turbine inlet cooling systems globally. As part of our market dynamics analysis, we have analyzed the market drivers, market restraints, and market opportunities. The report also provides a detailed analysis of the global turbine inlet cooling systems market with the help of Porter’s Five Forces model. The Porter’s Five Forces analysis aids in understanding the five major forces that affect the industry structure and demand for turbine inlet cooling systems globally. The forces analyzed are the bargaining power of buyers, bargaining power of suppliers, threat of new entrants, threat of substitutes, and degree of competition. The report also includes a glimpse of the global turbine inlet cooling systems value chain. The interaction and roles of various stakeholders starting from technology development and manufacturing to the deployment and final end-use have been elucidated in detail. The market attractiveness analysis involves benchmarking and ranking of each region on the basis of numerous parameters. The parameters selected are likely to have a pronounced effect on the demand for turbine inlet cooling systems in that region, both currently and in the near future.